The traditional methods of handling were to scruff, stretch, and force-restrain cats. The result: bites, scratches, and veterinary staff who were unsure of how to keep safe. 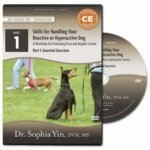 Learn low stress towel wrap techniques that will help you handle cats with skill and ease. Cats will remain calm and cooperative, and veterinarians and technicians will be confident handling their feline patients. Learn how to apply 6 towel wraps on cats to keep them feeling comfortable and secure and a seventh wrap for emergency situations. Recognize common handler errors that can cause cats to struggle instead of calm down. Evaluate which wraps are appropriate for a given cat, and learn how to know when to choose something else. 80 min / 1.5 units.